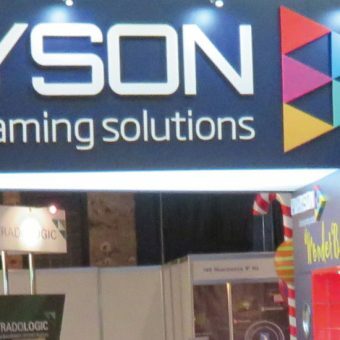 Playson create 3D and HD games on behalf of online and offline gaming companies. Though they are relatively new to the industry, they have managed to establish themselves as major contenders in an incredibly short period. In terms of company ethos, we are quite likeminded companies, both placing emphasis on building partnerships built on trust and mutual respect. 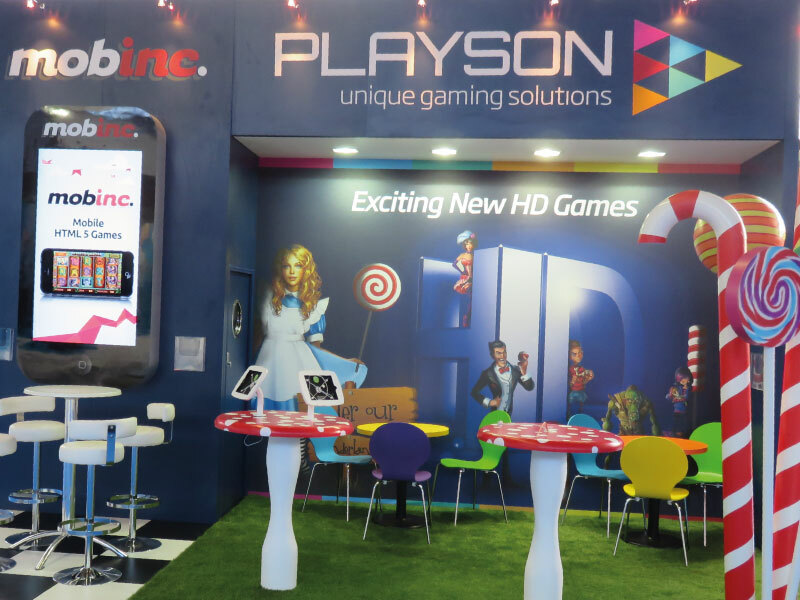 Playson presented us with the task of creating an eye-catching stand based on their latest game content inspired by the Lewis Caroll story of Alice in Wonderland, with a small section of the stand being dedicated to Mob Inc., their sub-brand focused solely on mobile games. We must admit, we were excited to be given such an unusual brief, so we went to town with this project – creating oversized candy canes, lollipops and toadstool table tops for demonstration purposes. 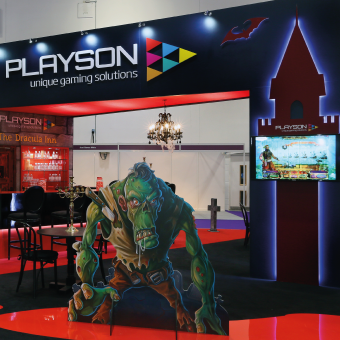 The backdrop that we decided upon was a large fabric graphic showcasing the crisp HD graphics of the game – experimenting with a number of different ink and substrate combinations before finally arriving at a level of finish we were happy with. We incorporated the Mob Inc. brand into the broader theme of the stand by using some elements of the Alice theme in the Mob Inc. section of the stand, but toning them down somewhat to allow the Mob Inc. brand to stand out on its own. 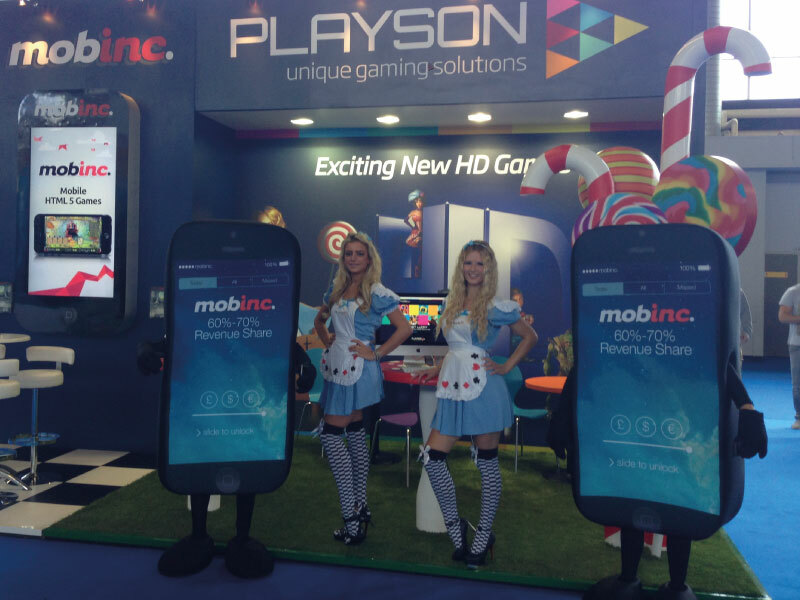 We also commissioned two life size mobile phone costumes to be worn by staff manning the stand, which proved very popular with attendees – particularly when paired with the Playson Alices, the costumes for whom we also sourced and branded.